How weird do you want to get? I have knit a lot of pairs of socks in my time as a knitter. I have been wearing hand-knit socks exclusively for about five years now. Without dragging them all out to count, I would say that I have about two dozen pairs. And yet, all but a few of those are just a plain old boring sock. Why? Because I have my personal "plain old boring sock" pattern memorized. It's like comfort knitting, I don't even have to reference any instructions. I just pick up the yarn and the needles and start knitting. There's something to be said for knitting plain old boring socks. But if you are growing weary of boring knitting (which I totally understand) there are an awful lot of options available. Sock knitting pattern designers are inventing some truly amazing ways to mix up the standard old sock. 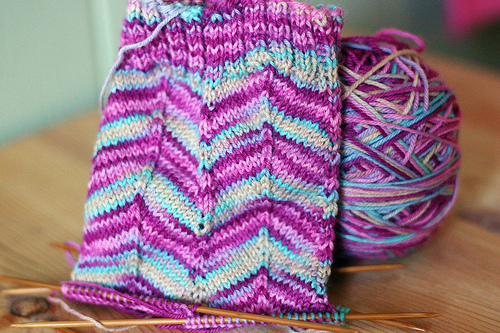 One of the most traditional ways to liven up a sock is with stranded colorwork. There are Nordic sock knitting patterns that will boggle your mind with their beauty and the complexity of their stitch pattern. And considering how many of these patterns are for knee high stockings, these babies will keep you busy for a long time! Cat Bordhi is probably the best known pioneer of unusual sock construction. Her recent book "ew Pathways for Sock Knitters is mind bending. Bordhi has found a ton of different places you can put the increases for the gusset, and each one of them will leave you reeling with the cleverness. It's easy to swap in a stitch pattern if you want to create your own. Just knit up a swatch, adjust the gauge, and you're good to go. If you prefer to let someone else do all the math for you, check out some of the popular sock patterns created by Wendy Johnson or Cookie A.